This computer had an integrated dot printer which can print on 40 to 132 columns at 120 cps, a 12" color graphic monitor and a dual 5" disc drives. A lot of cards were designed to be placed into the three expansion slots: an 8" disk controler, centronics interface, IEEE488 port, ADC/DAC card or ram expansion (64 or 128 KB). A bit of trivia: the video card has its own Z80 CPU. 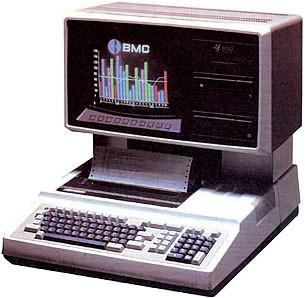 Apparently this computer was marketed by BMC outside Japan. I serviced IF-800's in the early 1980's. The printer was a 7 pin matrix mechanically related to the Oki Microline 82 but largely software driven. It was a frightful device. Both colour and monochrome screens were offered, and were excellent. The colour monitor had, as I recall, three seperate banks of 16K of RAM, one for each of the primary colours, providing an early form of 24-bit colour. Power for the main unit was provided through the monitor. Two people were needed to safely carry the colour monitor. The floppy disks were made by YE-Data and offered good capacity for the time - in the order of 500KB. They were of the solenoid head loading type and were ponderously slow but generally quite reliable. CP/M 2.2 and a standalone version of MS-Basic were supplied. Each system used its own disk format. Sadly, these were not interchangeable. Bitmapped graphics were implemented through the MS-Basic system only, as were the bezel-mounted screen "hotkeys". The IF-800 was crippled commercially by appearing on the market at the same time as the IBM PC-XT, which cost slightly less as I recall. They were distributed in Canada by Canada Computer of Markham, Ontario. see more OKI IF 800 Ebay auctions !